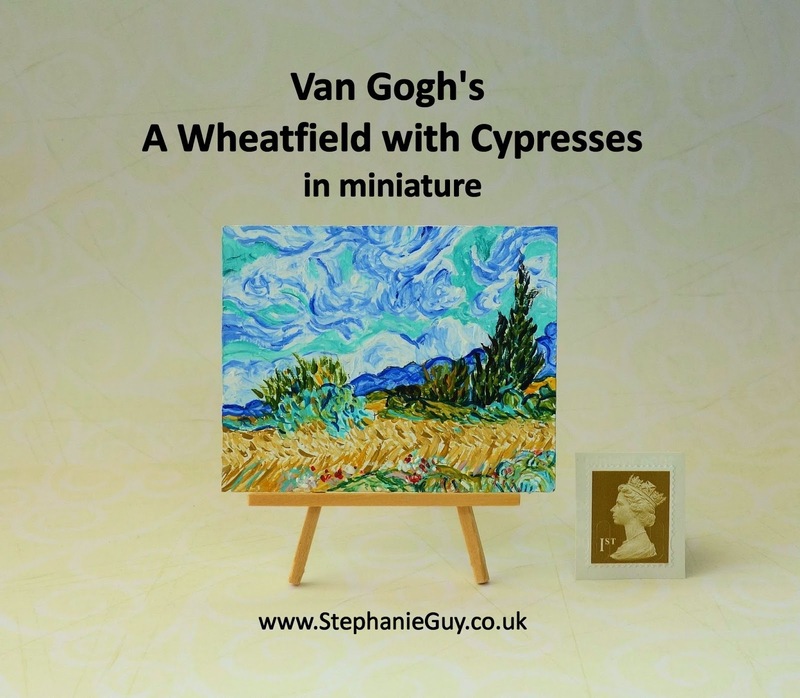 In this, the fourth in my famous paintings in miniature series, I will be showing you how to recreate Van Gogh's “A Wheatfield, with Cypresses”, 1889. In my Sunflowers article published in the January 2015 issue of Dolls House and Miniature Scene Magazine (also available here), I wrote about Vincent Van Gogh’s difficult and mentally unstable life. In May 1889 he checked himself into the mental institution Saint-Paul-de-Mausole at Arles, France, where he stayed voluntarily until May 1890. The view from his asylum window inspired many of his paintings from this period, including “A Wheatfield, with Cypresses”, 1889. “As for me, I don’t know what to wish for, first of all working here or elsewhere appears to me more or less the same thing, and since I’m here, staying here the most simple. Only there’s a lack of news to write to you, for the days are all the same, as for ideas I have no others except to think that a wheatfield or a cypress are well worth the effort of looking at them from close at hand, and so on. I have a wheatfield, very yellow and very bright, perhaps the brightest canvas I’ve done. The cypresses still preoccupy me, I’d like to do something with them like the canvases of the sunflowers because it astonishes me that no one has yet done them as I see them. It’s beautiful as regards lines and proportions, like an Egyptian obelisk. And the green has such a distinguished quality. It’s the dark patch in a sun-drenched landscape, but it’s one of the most interesting dark notes, the most difficult to hit off exactly that I can imagine. Now they must be seen here against the blue, in the blue, rather. Van Gogh worked his paintings on canvas. To recreate “A Wheatfield, with Cypresses” in miniature we need a support that will give the impression of a miniature canvas but without the weave of the canvas dominating the finished painting. I recommend using off-cuts of smooth mount board, easily obtained from a framing shop - if you ask nicely the proprietor will probably give you his off-cuts for free. Van Gogh's painting measures 72.1 x 90.9 cm. To find how big yours needs to be simply divide these measurements by the scale you're working in. On a 1:12th scale, dividing by 12 will give us 6 x 7.5cm; for 1:16th we need to divide by 16 to get 4.5 x 5.7cm; for 1:24th divide by 24 giving 3 x 3.8cm, and so on. I'm working at a 1:12th scale. Using your steel rule and craft knife, cut out the mount board to the correct size and apply 2 coats of gesso with a flat brush to prepare your canvas. This will stop your paints from soaking straight into the board. You'll need to leave it for at least a day to thoroughly dry. The drawing for this piece is complex. You can either use a grid, trace, or draw freehand. I have drawn out the main features on a grid for you to copy. If you choose to use a grid, divide your canvas into 4 x 4 equally spaced sections. They will not be squares since your canvas is rectangular, but I will call them squares for simplicity’s sake. 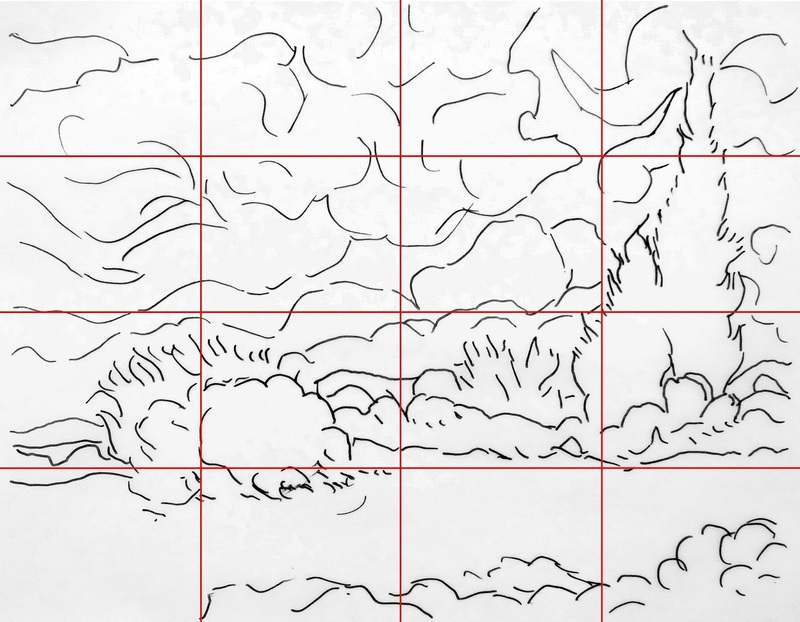 For this article I have drawn my gridlines heavily so that you can see them, but please draw your grid lines very faintly – the drawing is so complicated that you won’t be able to rub out your gridlines later. Starting in one of the corners, copy the black lines into your chosen square. Methodically moving from one square to its adjoining square, continue to copy the drawing until yours is complete. 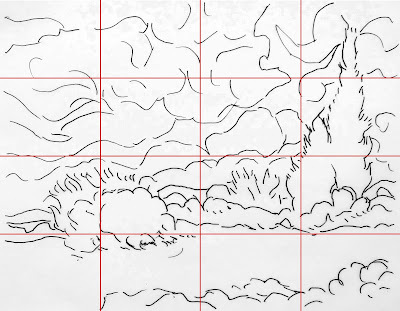 Try not to be tempted to jump around the grid – it is all too easy to make a mistake when counting squares and very frustrating to find that the drawing doesn’t meet in the middle! To make it easy to differentiate between the sections of the painting I recommend that you use less pressure on your pencil to draw the sky and more pressure on the ground and foliage. Mix Titanium White with a tiny amount of Pthalo Green and using small motions and your size 0 round brush, paint in the green sections of the sky. Mix Titanium White and a tiny dab of French Ultramarine and using short swirly marks begin to add in the blue areas in the sky. Although Van Gogh put most of the texture into the wheatfield, there is a little texture in the sky as well, so use some Titanium White to create a few raised textured lines. Add French Ultramarine to your French Ultramarine/Titanium White mix to darken it slightly and paint the mountains. Again, keep your brush strokes short and curved. Mix in a little white to the French Ultramarine/Titanium White mix and define the lighter sections of the mountains. Clean, dry and put away the Size 0 brush, we won’t be needing that one again. Switch to the size 00 brush and outline the mountains in French Ultramarine. Mix Arylamide Yellow Deep with Pthalo Green and paint the first section of the green in the middle-ground. Use this same mix to add the grasses on the left hand side, varying the mix of Arylamide Yellow Deep and Pthalo Green and using short strokes leaning towards the left. Use some pure Arylamide Yellow Deep on the centre right of this section. Mix Yellow Ochre with a touch of Arylamide Yellow Deep and Titanium White, and use this to paint the yellows in the centre ground. Going back to the Arylamide Yellow Deep/Pthalo Green mix, use this to paint the bush to the left of the Cypress trees. Use tiny amounts of pure Arylamide Yellow Deep and pure Yellow Ochre to add highlights. Using a series of short slightly curved brush strokes, build up the Cypress trees using a variety of Arylamide Yellow Deep/Pthalo Green, Yellow Ochre/Pthalo Green, pure Pthalo Green, and Pthalo Green/Crimson mixes. Mixing Crimson with Pthalo Green will give us the lovely dark green for the defining marks on the trees. Using your darkest green, paint the small bush in the centre and add a few short marks to the bush immediately left of the Cypress Trees. Moving on to the next bush, use short varied upwards moving strokes in Pthalo Green/Titanium White. Next add in some Yellow Ochre/Pthalo Green/Titanium White strokes and finally some French Ultramarine/Pthalo Green mix. Move left with the Pthalo Green/Titanium White and loosely paint the small bushes on the very far left. Then take your French Ultramarine/Pthalo Green and paint in the outlines over all of the middle ground. Now we move on to the wheat field. Van Gogh has lots of texture here so we need to use the paint quite thickly. Clean your brush thoroughly, pick up some Yellow Ochre on the very tip of your size 00 brush and paint short directional lines. Mix some Titanium White into the Yellow Ochre in various amounts and use this to complete the wheat field. Note that the long wheat grass in the immediate foreground points to the right and the tops of the wheat behind points to the left. With a circular brush motion and Titanium White/Pthalo Green, Yellow Ochre/Pthalo Green, Arylamide Yellow Deep, and Titanium White, add in the bushes in the right hand foreground. Paint the middle foreground using Yellow Ochre, Arylamide Yellow Deep and Titanium White. The mound in the middle of this section is almost pure Titanium White. Bring in some Pthalo Green/Titanium White strokes into the foreground wheat grasses. Add some Crimson dots to represent the flowers on the front left hand side of the foreground. Mix Crimson,Titanium White and French Ultramarine until you have a very pale purplish off white. Add this around the red flowers from step 23, and in a small strip to the right of the almost-white mound in the middle. The effect here is very subtle but worth doing! Return to the Crimson and add in the remaining flowers in the foreground, noting that they are shaped like tiny chilli peppers. Dilute the Crimson with water or acrylic medium for the flowers in the far right hand bushes. Using some of the Pthalo Green/Arylamide Yellow Deep mix that is already in your palette, draw in the defining lines around the foreground bushes. Dot in some Titanium White around the flowers. Finally, take an objective look at your painting. Step back and squint at it, hold it up to the mirror, take a photo of it on your phone or digital camera – any of these techniques help to create some distance between yourself and your work, and usually any errors will jump out at you. Study it carefully and make improvements where necessary. I cannot see a signature anywhere on this piece, so I’m calling mine done. In 7 days time it can be varnished and framed in either a rustic wooden frame such as Van Gogh himself used, or in a more ornate frame like those that were used after his death when his paintings became valuable. If you have a go at any of my painting tutorials I’d love to see your artwork, you can share it in the comments below, on my facebook page or email it to me. My contact details are below. To make my own stay-wet palette I use a small plastic takeaway box lined with wet kitchen roll on the bottom and greaseproof paper on top. When I leave my paints for any length of time I simply put the lid on and the paints stay workable. Always store your brushes flat, never resting on their points as this will damage them (either in or out of your water). Wash your brush in a series of three water pots, beginning in the dirtiest water pot and working towards the cleanest. You should find that this means that your clean water will stay clean for longer, you will need to change water less often and your colours will not get muddy. Dab your brush on an old rag or piece of kitchen towel before picking up fresh paint. Always wash your brushes before leaving them for any length of time. Dried acrylic is difficult to get out of brushes and will ruin the flexibility and point of your brush. If paints in your palette begin to form a film, spray with water. If your paints feel too thick, you can dilute with a small amount of water or a medium such as Atelier Interactive’s Clear Painting Medium. If the paint on the brush becomes blobby, clean it and pick up more paint with the tip of the brush. Remember we’re painting miniatures, you don’t need to squirt out a lot of paint from your tubes, just a pea sized blob at a time will suffice. Stephanie sells her work through her website www.StephanieGuy.co.uk. You can make contact and see more work in progress, hints and tips on facebook instagram and twitter, or via email StephanieGuyFineArt@gmail.com. I was very excited to see another version of this painting by Van Gogh in the Kunsthaus museum in Zurich, Switzerland. Van Gogh was renowned for painting the same scene obsessively. How thrilling come across another one! Thanks so much for dropping by, I do hope you enjoy reading my blog. Come on in, leave a comment and join the chat! Do NOT varnish acrylic ink paintings! All images protected by copyright. Simple theme. Powered by Blogger.